A group of Japanese experts, who had been given access to the LTTE-held area shortly after tsunami in December, 2004 had helped terrorists build a channel to launch underwater craft. The foreigners had worked on the project for some time in a high security zone in the Puthukudirippu area, well informed sources said. Responding to our queries, sources said that though the 58 Division had found a 360-foot long and 25-foot wide tunnel and a 300-foot long and 30-foot deep dock early May, the involvement of Japanese experts in this project had not come to light until recently. Sources said that the then Brigadier Shavindra Silva’s troops had captured the tunnel in the Irattavaikkal area three weeks before the army finished off the LTTE leadership on the banks of the Nanthikadal lagoon on May 19. Sources said that the LTTE planned to float the submersible from the dock to the sea through the camouflaged tunnel. Sources asserted that the LTTE could have used the same technique to take in a submersible. 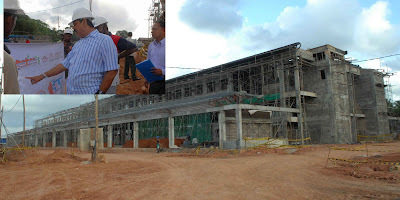 In the wake of tsunami, the then UNF government allowed experts from many countries to launch rehabilitation and reconstruction work in the LTTE-held area. According to information from LTTE suspects in custody, the Japanese team had also helped them develop submersibles though their first attempt to test the first craft ended in failure. Divers subsequently recovered it close to Farah III, a Turkish ship which had run aground at Vellimullivaikkal. The LTTE had smuggled in a range of items needed for this particular project from overseas before the navy cut off their supply route north-eastern coast. The LTTE had powerful Japanese built outboard mortars, radar and communication equipment among several other items recovered by the army and navy, especially in the eastern Vanni. Sources said that a Sri Lankan Tamil probably domiciled in Japan had accompanied the experts who left the area well before the resumption of hostilities in August 2006. Sources said that interrogation of terrorists, particularly those with specialised units would shed light on top secret LTTE operations. During the LTTE rule, the group also brought in foreign experts from several countries to boost its strength. Defence Secretary Gotabhaya Rajapaksa last week said that the LTTE had invested heavily in a programme to undermine the Sri Lankan navy. The recovery of a vast amount of armaments, explosives laden boats, torpedoes and other equipment was evidence of this strategy. COLOMBO: Sri Lankan President Mahinda Rajapaksa has said that his country will develop its own model of economic development based on a strong agricultural sector and not follow the existing Western models in which industrial growth gets precedence. The rate of inflation, as measured by the point-to-point change in the Colombo Consumers’ Price Index (CCPI), decreased to 0.9 per cent in August, from 1.1 per cent in July. The annual average inflation rate also continued on its declining path which had commenced in November, 2008 and recorded a single digit level of 8.5 per cent, compared to 10.4 per cent in July 2009. It is noteworthy that this is the lowest annual average inflation rate recorded since 2006, states the Central Bank of Sri Lanka. 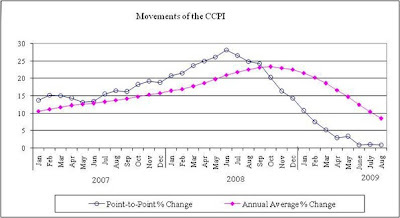 The CCPI decreased marginally by 0.3 per cent over the previous month, with the Index moving downward to 208.1 from 208.7 in July, 2009. The contribution to the monthly decrease in the Index arose mainly from the Food and Non alcoholic beverages sub category. All the other sub categories recorded monthly increases, especially Education, Transport, Clothing and footwear, and Housing, water, electricity, gas and other fuels. The Core inflation, on a point-to-point basis, increased to 6.4 per cent in August, as compared to 6.0 per cent in July, 2009, while the annual average core inflation declined further to 13.2 per cent in August, 2009 from 14.2 per cent in the previous month. Under the firm guidance of Defense Secretary Rajapaksa, the Sri Lankan military did what the Tamil Tiger leadership least expected it to do—double its manpower and bring the fight direct to the enemy and inflict decisive psychological wounds. This was all-flanks engaged warfare based on common-sense and strategic insight. It was brilliant as it was simple, making many wonder why it hadn’t been instituted before. So states the Manila Times of Aug 31, 09 in its regular column "Open Notebook" by Random Jottings, written by a senior correspondent of the MT who was in Sri Lanka recently. When asked if he felt his work was now done, the Defense Secretary (whose all encompassing brief also includes public security and law and order) notes: “To a certain extent it has. But now we have to put in place a good intelligence network to ensure that the security of our country is never again compromised by internal fighting forces. "Without development, there won't be peace; we must develop the economy, I don't want to just be the liberator, I want to be the leader who brings permanent peace and development to this country and reconciliation with Tamil communities in the North and the East", said President Mahinda Rajapaksa in an extensive interview with the ‘Forbes’ Magazine. "The war is over," he said. "Now we have no excuses. We have to start working and develop this country." “I am a president for the whole nation. I divide people not as Sinhalese or Tamils or Muslims or Burghers. I divide them into people who love the country and people who do not,” the President said. He said he speaks Tamil when he wants to, as he can approach them more closely by speaking to them in their own language. The President Rajapaksa spoke of the country’s current economic trends and said even in the war time the economy grew by at least 6% each year. Inflation is now down to 1.1%, from 11% four years ago, according to Central Bank figures. And he notes that per capita income has risen on his watch from $1,200 to $2,000. He spoke of his government’s commitment to economic development and said "We must have a Sri Lankan model." … "I prefer to be agriculturally based. If you can be self-sufficient in food, then the industries will come," he said. 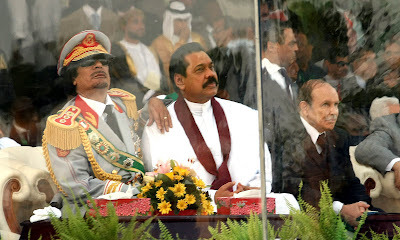 On the question on inquiries into alleged violations of Human Rights during the war, especially in its final stages, President Rajapaksa said “We must not follow what happened in Africa or in Europe." ... "I don't think it is healthy to start digging into the history, these problems. We must forget about the past and start a new life, new thinking," he further said. When ‘Forbes’ Magazine asked the President, ’whether Sri Lanka does 70% of its business with the West, now have new best friends, he said “Whoever wants to help me, I will welcome them without strings," and said “I have invited Americans. New bridges and dams are being done by the British and Canada." He said he’s instituting a Singapore-style "one-stop shop" to limit paperwork and smooth official contacts. "Every ministry and department wants to be the king” and the President said he has "zero tolerance of corruption”. “If you give me the evidence, certainly I will take action against anyone," he said. ‘Forbes’ reported that: For now, bottom-fishing investors are looking at the country with new enthusiasm. Singapore's Calamander Capital is raising $75 million for what it claims is Sri Lanka's first private equity fund, targeting the plantation and ceramics sectors. Chief Executive of Colombo's Hatton National Bank, Rajendra Theagarajah, wants President Rajapaksa to encourage "Lankans overseas to invest as part of their contribution towards nation-building." "I am the man who is closer to the people and who would risk my life for the country. That's why I won the war, and that's why I'll win the economic war, too," the President said. President Mahinda Rajapaksa who left for Libya for a two day official visit to attend the 40th anniversary of Libyan revolution arrived in the Mitiga International Airport in Tripoli yesterday(Aug. 31). The President was warmly welcomed by the Libyan Planning Minister Abdul Hafeed Al-Zlatny and Sri Lanka Ambassador to Egypt I. Anzar. President Rajapaksa was accorded a Guard of Honour on his arrival at the Mitiga International Airport in Tripoli. President Rajapaksa will hold bilateral discussions with Libyan leaders and he is expected to meet a number of world leaders who would also be in Libya to attend the anniversary. Sri Lanka will soon call for fresh bids for oil exploration in the waters of the Mannar Basin off the north-west coast, Central Bank governor Nivard Cabraal told an investment conference in Colombo. Sri Lanka has already given out one block to Cairn India, a unit of Britain's Cairn Energy which plans to do more seismic surveys next year and dig test wells. 30-year war against terrorism with the defeat by government forces of LTTE in May. He also had said oil exploration was one of the sectors that have potential in the country as the government prepares a blueprint to revive the economy after decades of war. Aug. 31 (Bloomberg) -- Sri Lanka’s inflation slowed in August, giving the central bank room to cut interest rates to stoke an economic revival after the end of the island’s three- decade civil war. Consumer prices in the capital, Colombo, rose 0.9 percent from a year earlier after gaining 1.1 percent in July, the statistics agency said on its Web site today. Central Bank Governor Nivard Cabraal, who predicts 2009 inflation at 5 percent, on Aug. 18 said there was still room to cut interest rates after three reductions earlier this year. The South Asian island’s $41 billion economy is on the “right track” and will strengthen in coming months, Cabraal said. The Central Bank of Sri Lanka on Aug. 18 kept interest rates at a three-year low, holding the reverse repurchase rate at 11 percent for a second straight month and maintaining the repurchase rate at 8.5 percent. Cabraal last month said there was “space for interest rates to come down further,” helping the government reduce the budget deficit in accordance with a $2.6 billion International Monetary Fundloan agreement. The central bank wants lenders to cut borrowing costs before it lowers its key rates further, Cabraal said Aug. 18. The IMF’s aid package and improved investor confidence with the end of the civil war have helped attract foreign flows and eased local borrowing costs, the central bank said July 23. There is an intense search on for LTTE cadres and active supporters who survived final defeat. Intelligence reports say they could rebuild the LTTE and even now are trying to carry out terror activities. Some of this information is coming from questioning now being done of Selvarajah Padmanathan aka ‘KP’ the foreign based leader of the LTTE after the death of Prabhakaran, who has the information on operational details and contacts of the LTTE as well as information on money collected from expatriate Tamils to be used for the terrorist activities of the LTTE. So says ‘Strategy Page’ site in a story on current developments in Sri Lanka, published Aug. 30. The report adds that while European and American politicians and media strongly criticize Sri Lanka over the treatments of Northern Tamils and want the refugee centers released immediately this is not likely to happen for serious security reasons. It adds that “India is much more sympathetic to the Sri Lankan government on this issue, as India knows all about fanatical sects and political movements and was also subject to LTTE terrorism. Europe wasn’t, and doesn't understand. Thus the camps will only be closed when all the LTTE members inside them are identified, and no sooner”. August 30, 2009: The government believes the LTTE has been crippled, with the capture of their new leader, Selvarajah Pathmanathan. This was because Pathmanathan, as leader of the LTTE gunrunning operation, kept many operational details and contacts to himself. Any successor will have to rebuild much of the organization without that knowledge. Pathmanathan also controlled a lot of the money collected from expatriate Tamils, and now those contributions have dried up (partly because the LTTE has been declared a terrorist group in so many nations). The government is negotiating with Pathmanathan to find out where the remaining funds are, and what shape the offshore LTTE organization is in. While many Sri Lankans want Pathmanathan executed, or jailed for life, Pathmanathan is a skilled negotiator who is intent on talking his way out of a death sentence. Pathmanathan also has information on the organization that only the senior leadership had. He is able to let the government know how large the organization was in Sri Lanka before the final offensive, that ended the war, began last year. There were 30,000 LTTE members back then. Not all were armed, but all were organized, and the army captured lots of records listing who they are. Most of these LTTE staff survived the final campaign, and the government is looking for them. These are the people who could rebuild the LTTE, and who are even now trying to carry out terror attacks. The government is pretty angry at the criticism it gets by European and American politicians and media, over the treatment of the northern Tamils. Many prominent Europeans want the Tamils in refugee camps released immediately, and Sri Lankan security forces prosecuted for war crimes. This sort of thing enrages the Sinhalese majority in Sri Lanka, and results in accusations that these foreign critics are a bunch of pro-terrorist, delusional, racists (who imply that the Sri Lankans cannot govern themselves). India, the original home of the Tamils (who are a minority there, comprising only about six percent of the population), is much more sympathetic to the Sri Lankan government. Partly, this is to keep the Chinese out (who are offering all manner of attractive commercial deals to Sri Lanka at the moment). But India knows all about fanatical sects and political movements, and was also subject to LTTE terrorism. Europe wasn’t, and doesn't understand. Thus the camps will only be closed when all the LTTE members inside them are identified, and no sooner. Meanwhile, some atrocities have taken place, but often against Sri Lankans who don't get along with the police. Over more than two decades of terrorism and violence, the national police have acquired an attitude that they are above the law. Cross the cops, and you end up dead, or maybe just beaten, or crippled. To show you a lesson. Popular anger against this sort of thing has been building for some time, and politicians realized that they could no longer get away with not dealing with it. So, since the LTTE was crushed earlier this year, more police have been arrested and prosecuted for misconduct. The police, in turn, have been ordered to crack down on the criminal gangs, who flourished during the last two decades, often by being the paid accomplices of the LTTE. There is also fear that the criminal gangs will get their hands on some of the hidden LTTE weapons, and put them back into circulation. Today alone, troops and police found dozens of bombs, rifles and much ammunition up north. While much of these hidden weapons are found based on tips from Tamils in the camps, other stuff is found simply by examining likely hiding places. The north apparently has over a thousand of these hidden weapons caches. Much more has been hidden, like secret agents within the government and military. Earlier this month, interrogations of captured LTTE members revealed that the cook (for the last seven years) of the head of the army (general Fonseka, recently promoted to head of the armed forces) was an LTTE agent. Several other well placed agents have been revealed, and there are apparently dozens more who are still in place (and no doubt trying to figure out how to flee the country). August 29, 2009: In the north, troops searching for weapons, uncovered a hidden warehouse containing 140 landmines, and many other weapons.